We broadcast our Sunday morning message from this page at 11:05am. If you have any comments or concerns, please email us. To view past broadcasts go here. 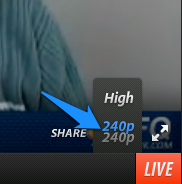 If you are having trouble viewing our broadcast, try changing the video quality setting to 240p. Do you want to be notified when new sermons are added to the site? If you are trouble viewing our broadcast, try changing the video quality setting to 240p.